Many local businesses find themselves in a conundrum. They have a great product that people need, but they aren’t seeing any foot traffic in their store. For some products, such as propane tanks, farm-fresh milk, or water jugs, the reason for that lack of foot traffic is because there is simply a better way to get products to your customers: offer a recurring delivery service for your local customers. 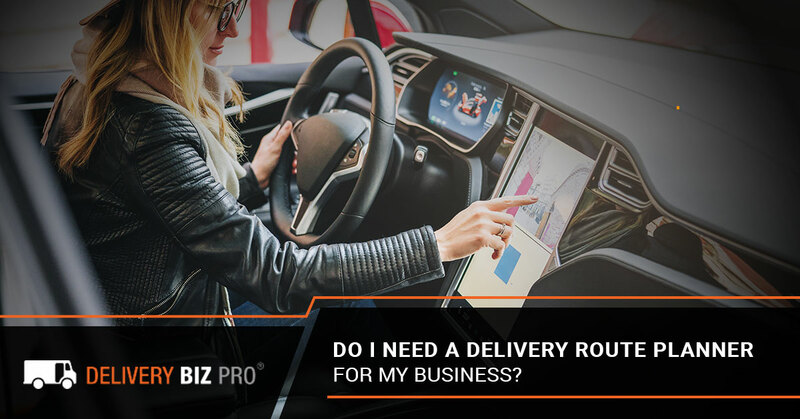 If your business is moving in the direction of offering recurring deliveries you will need a way to map out deliveries in a way that makes sense. Or, if you are already offering delivery but it seems to be more work than it’s worth, you could be using the wrong route planning tools. Delivery Biz Pro seeks to offer a solution to businesses looking for an easy, efficient way to make deliveries. With our delivery routing software, customers and their orders are seamlessly integrated with the route planner system, so mapping our driver routes is incredibly simple with our system that does all of the hard work for you. Gone are the days of trying to keep everything organized in spreadsheets or creating routes by hand. We know a lot of people are on the fence about using a delivery routing software. After all, isn’t that what the map feature on your smartphone is for? But we also know there’s a better way. With the technology we have available today, there’s no reason not to use an industry-specific delivery management system. Your business makes recurring deliveries. This is possibly the most obvious sign that your business needs a delivery routing software. When planning delivery routes, you really need to be using a tool that is integrated into your customer database that can organize routes and ensure the right deliveries are made to the right homes. With our routing software, for example, you can alter routes based on your business model. If you serve a small area and only deliver on Mondays, your routing software can handle that without a problem. If you deliver to the east side of town on Mondays and the west side on Wednesdays, you can create two routes based on a customer’s location. Even if you have some customers who want deliveries on different days of the week or who only need deliveries every other week or once a month, using a route planning software takes the complication out of handling all of these different variants. Your drivers sometimes miss deliveries or deliver the wrong items. To err is human… which is why we think a software makes a better route planner than a human. We don’t want to imply that technology needs to run every aspect of your business. After all, a software can’t shake the hand of a potential investor or prepare a healthy diet for your hens so they lay perfectly shaped eggs. It can, though, look at the addresses and orders of all of your customers, place them in a logical order on a map, and create a route for your drivers to follow — all in a matter of seconds! Want To Learn More About Our Routing Software? Let's Chat! Your customers are interested in delivery or your competitors are already delivering. Perhaps you don’t currently make recurring deliveries, but you have heard from loyal customers that they would love to see a delivery option or you notice your competitors in the area are delivering. If this is the case, making the move toward a home delivery system can be the boost your business needs to stay relevant. Of course, you don’t want to start offering delivery without a solid plan about how you’ll make it happen. This is especially important for those in the meat, egg, dairy, and produce industries as you will need more than a delivery management software and a truck to start making deliveries. You will need ways to ensure your customers don’t get spoiled products, which usually involves investing in some sort of porch ice box or insulated packaging with ice packs. Using a software like ours, you can have your customers put a deposit on these items and mark off who has outstanding containers and who has returned them in good condition. You want to modernize your business. Delivery is convenient. It’s as easy as that. And in today’s busy world, many people would rather spend time after work and on the weekends with their families, not driving to the store. People are willing to spend a few extra bucks to have their propane tanks or groceries delivered to their front door if it will save them an hour of their time. Offering efficient, reliable delivery to your customers will make their lives easier. And while you make their lives easier, there’s no reason to run yourself into the ground trying to plan out routes by hand or using a route planner that isn’t industry-specific or integrated with your orders. A route planning software can make your life better and your customers’ lives better — we believe that’s what they call a ‘win-win situation’. Need More Reasons To Use DBP? Let’s Chat! Our software integrates everything from customer signup, order placement, and payment to truck loading, routing, and post-delivery notifications. Currently, the DBP software is responsible for routing well over half a million deliveries every single week. In fact, our system handles the routing of over 600,000 deliveries for local farmers and small business owners who are making their businesses better by offering reliable delivery services. But we do more than just map out deliveries. We have done everything we can to ensure that you can truly depend on our software. With your own server, you won’t have to worry about slow service, and with two automated daily backups, so you never have to worry about a major calamity where you lose all of your valuable information. We also only integrate with PCI-compliant gateways to keep not only your information, but your customers’ information safe and secure. In other words, we’re so much more than a delivery software, and we want to prove it to you. So, what are you waiting for? Get in touch with the DBP team today to get more information about our delivery routing software. We’ll set up a time to chat and discuss if our service is right for your business model. Just like you earned your customers’ business, we want the opportunity to earn yours. Give us a call or send us a message and you’ll discover the Delivery Biz Pro difference.